Disgraced historian David Irving yesterday compared British justice to that of the Third Reich. The Holocaust revisionist launched his outburst as he attended court to support his friend Gerald Toben, 64, who was arrested on a German extradition warrant during a stopover at Heathrow. Toben is accused of publishing internet material between 2000 and 2004 that ‘denies, approves or plays down’ the Holocaust, which is illegal in Germany. Outside Westminster Magistrates’ Court, Irving, 70, said: ‘This type of procedure demeans our society in that the Germans and Austrians can dictate to us what we feel and can say and what we read and write. They lost that right in 1939. Irving, who was jailed in Austria in 2006 for denying the Holocaust, plans to invite Toben to stay at his home in Windsor if he is granted bail next week. He went on: ‘I disapprove of some of his views but he has the right to express them, just as people disapprove of my views but my books and views are suppressed. Last night D-Day veteran Roland Jefferson, 83, who landed on Juno Beach in June 4, 1944, said: ‘Irving is a lunatic and I’m not happy with his comments that are bound to make a lot of veterans angry. 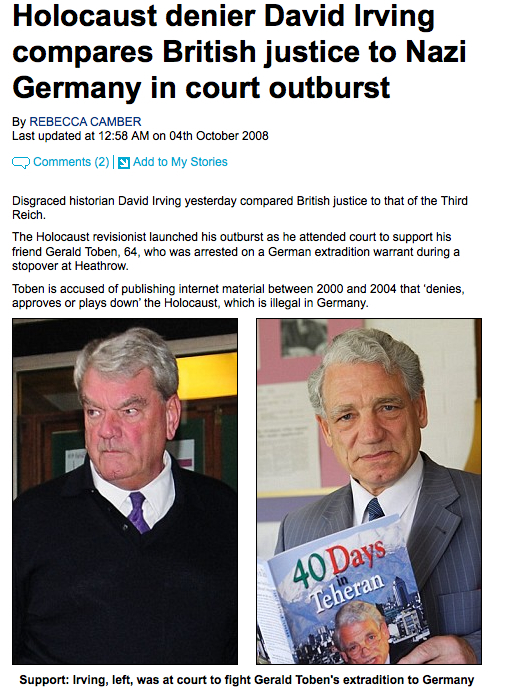 Be the first to comment on "Daily Mail: Holocaust denier David Irving compares British justice to Nazi Germany in court outburst"